Additional Information Can also be seen at the Queensland Lyme Disease Website: This includes a Display of "Little Lymies" and people living with Lyme disease in Australia. Flyers with further information on Lyme disease (available on the Karl McManus Foundation website) will be handed out at the protest. 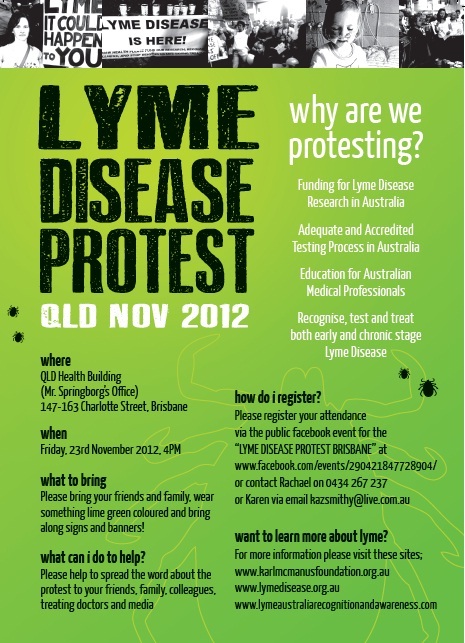 The KMF foundation will also have donation cans at the protest: It is currently the only organisation undertaking research (through private funding and public donations) into the existence of Lyme disease in Australia. If you would like to hand out copies of the poster (to friends, family, medical centres, etc), the following is a PDF printable version of the above protest poster.